WiserSKILLS offers the most complete skill and motivation mapping solution. WiserSKILLS is an online platform that helps your employees describe all their skills, desires, and motivations intuitively. Based on skills declared directly by the people concerned, the WiserSKILLS tool suggests related skills to guide employees and help them build a complete profile. In addition to professional competencies, WiserSKILLS also takes into account employees’ outside activities and motivations. With its advanced matching algorithms, WiserSKILLS helps your employees take their career paths into their own hands. WiserSKILLS helps them ask the right questions and take an active role regarding their employment potential. The solution helps them identify the job functions that fits them best. A virtual Career Coach tells them about the skills they need to acquire in order to access certain job functions. 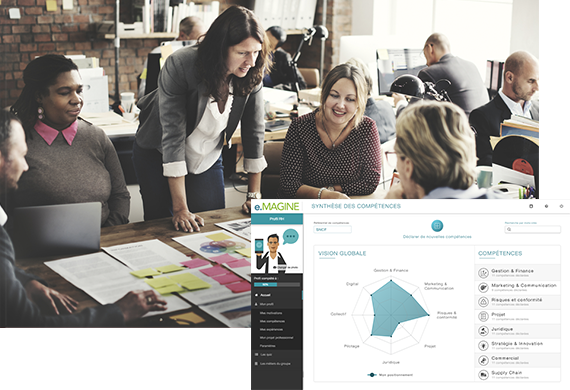 WiserSKILLS gives HR teams a tool based on operational reality to assist job function transformation. By leveraging accurate knowledge about the skills and motivations your company has, or needs to acquire, WiserSKILLS enables HR teams to look forward and implement actions to develop the skills that the company will need in the future. Implementing powerful algorithms, WiserSKILLS gives you the means to imagine new gateways to mobility, and to save time when filling internal positions. Our dedicated team is available to help you on a daily basis. Our consulting partners – expert HR firms – also work with you to ensure that your project succeeds. A Smartdata foundation based on your company’s day-to-day reality. Fast and easy implementation, regardless of your IT environment or company size. Technology that processes available data to make it agile and easy to use.